The mediation in the United States has long been used as an Alternative Dispute Resolution throughout the Court Systems around the country significantly reducing the court backlog. In light of its settlement results, the method has also been applied both by the private and public sectors. Therefore, time and money that would otherwise be spent in costly and lengthy litigation, have been saved. In Brazil and other countries the method is not so common, but things have changed. In 1975 the first CDS (Citizen Dispute Settlement Center) began operating in the city of Dade, Florida. It was a way found to solve controversies among the residents of that city without the intervention of a judge. These centers are considered the forerunners of the current out-of-court method of conflict resolution known here in the United States as Alternative Dispute Resolution; in Brazil MESC (Extraordinary Means for the Resolution of Controversies). The Florida Court System has used this method for over 30 years. In Brazil, Law 13.140, considered the Legal Framework for Mediation, was approved in 2015. The principles guiding mediation are: the mediator's impartiality; isonomy between the parts; orality; informality, autonomy of the will of the parties; consensus search; confidentiality and good faith. It is worth emphasizing that the only conflict that can be mediated is the one that consists of available rights or unavailable rights which allow a negotiation. In an initial analysis and free of dogmas, it can be said that mediation, among other methods of conflict resolution, is an institute that can contribute a whole lot to alleviating the heavy burden of approximately 110 million cases that were processed in Brazilian courts in the year of 2016, according to data from CNJ - National Council of Justice. Because I have been living in the United States for five years, I will not talk about the reason of resistance that mediation still suffers on account of the community including lawyers and judges. I will only say that since the law is new, I believe that this will change, for the good of the Brazilian legal system. But the number stated in the previous paragraph serves as a starting point for the intention of this article, which is to talk about my experience as a mediator in a court in Florida, United States, and how the judges here see mediation. 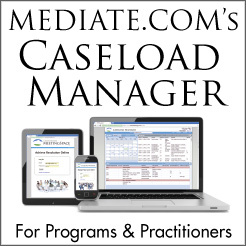 Judge Hal C. Epperson, Jr. of the Osceola County Courthouse, responsible for the judgment of civil cases that are not pacified during mediation, stresses that "without the mediator it would be impossible to perform my work in an agile and efficient manner." My colleague in the Mediation Program of the Ninth Judicial Circuit of Florida, former Judge Janis Halker Simpson, points out: "The Program is essential to the proper functioning of the courts." The majority of cases, unlike what is portrayed in Hollywood fiction, will not go to trial; the judge only reviews and approves the mediation agreement entered into between the parties. There is no famous hammer strike but a handshake between the parties. And I am only talking about mediations designated by the judge, not the extra-judicial ones, which are carried out in the private circle and may or may not be ratified by a judge. There are several types of mediation, three of the most used are: the transformative, the evaluative and the facilitative, which is the most common in the Florida courts for mediation of civil cases with a value of up to $5,000, approximately R$ 17,000.00 (Brazilian Reais). The transformative is more focused on the interpersonal relationship between the parties and, although it seems ideal for disputes between individuals, it can also be a powerful tool for commercial disputes where common emotions often speak louder. In this case, the mediator's role is to first understand through discussions between the parties their perceptions and feelings. If the emotions are strong, agreement may be difficult, but once overcome, rationality rules and the mediator can focus on the interests of the parties. Evaluative mediation seeks to highlight the strengths and weaknesses of the case, where the mediator, usually a former judge or lawyer, offers a merit analysis for both parties. The mediator may, for example, predict the outcome of the dispute if it goes to trial, and the percentage of chances of success. But, as I previously mentioned, the more common is facilitative mediation. The mediator is a facilitator, a third person whose primary function is to explain the process, what can and cannot be done in a mediation. It is not up to the mediator to give opinions, influence, or give legal advice. He can, based on the interests and concerns, help find a solution that accommodates the strongest interests of each party to the extent that both parties, voluntarily and consensually, begin to consider that resolving the conflict is better than letting a judge or a jury (here, although uncommon, even small causes can be decided by a jury) decide the cause. Legal disputes here are very, very expensive. But that’s not the only issue. What is at stake is your time, your health, your time off work, your psychological state. It is clear that in a judicial dispute involving stratospheric values, very complex cases; perhaps a Court is the ideal place to resolve the conflict. I say maybe because even in these situations, there are still other means than the judiciary one to pacify a cause, such as arbitration, which is not the subject of this article. I am only saying it is widely used in Europe and the United States with successful results. In Brazil, it has also been quite used and respected by the courts. The Special Court of the Superior Justice Court is known to have adjudicated various arbitral court sentences from other countries such as England and the U.S. According to data from the U.S. Department of Justice, body of the Federal Executive Branch that utilizes Alternative Dispute Resolution in its litigation for the country, in 2016, there was agreement in 75% of the cases where mediation was used by the parties voluntarily. In the procedures ordered by a judge the index was 52%. In financial terms, mediation provided a savings to the government and, ultimately, to taxpayers, of $ 70,610,263, approximately R$ 250,000,000 (two hundred and fifty million Reais). Working days spared by lawyers and employees who were not required to get involved in court battles: 26,388. The alternative means for conflict resolution provide many advantages that go beyond costs, but professional help is needed to assess the best means for each case. If mediation is used improperly or at the wrong time, it can become a problem and not a solution. In an unsuccessful mediation, for example, it may be necessary to spend more money if the case has to inevitably be brought to court. As to the advantages, the speed in which you can reach a solution is one of the attributes. In court, a case can take months, even years to be adjudicated, whereas in mediation cases can be resolved in a matter of minutes, hours or no more than a couple of days. In mediation the parties have control of the dispute and not a judge. Most of litigious proceedings are open, however, in mediation; confidentiality is one of the pillars. One of the reasons for choosing a confidential process would be to keep personal or business information or the outcome of the case confidential. Even the winning party in a litigation case can express dissatisfaction. Perhaps because they may have unrealistic expectations or made an erroneous evaluation of the potential of the opposing party’s case. Clients tend to express higher levels of satisfaction with mediation or negotiation where they have succeeded, probably because they have been involved in all phases to reach an agreement and certainly, had more control over the process. In two years working as a mediator in the Osceola County 9th Circuit Court, in Florida, I mediated 448 small claim cases. The majority of cases involved credit card debts, hospital debts, conflicts between property owners and tenants, breach of contract, and auto repairs. The index of agreements at the end of the mediations reached 62%. But the numbers, although important for the reasoning of an argument or point of view, do not say everything. Therefore, I must contextualize. At the beginning of this article I made reference to the years of 1975 and 2015. The 40 year difference between the start of mediation in the state of Florida and the approval of the Legal Framework of Mediation in Brazil is very big. The process here has already been tested, approved, and carried out. There is no contest; it is efficient. In Brazil, I want to believe that every effort is being made so that the culture of litigation is part of the past. Here in the United States, in fact, mediation is an ability more and more valued and sought after by employers when it comes to hiring an attorney. Large companies, public and private, are creating dedicated departments exclusively for the resolution of potential conflicts without the intervention of the judiciary system, thereby saving millions of dollars that would be spent on litigation. One of the main qualities of a good mediator is knowing how to listen, but it is time to speak, publicize, and practice mediation. Donna Dorer, Coordinator of the Mediation program at the Osceola County Court, says that mediators are peacemakers. It is true. To mediate is to leave behind disagreements and adversities, be it in the legal world or in the daily life of each citizen. 1- Alternative Dispute Resolution, Mark V. B. Partridge. Oxford. 2009. 3- justice.gov (The United States Department of Justice). Accessed on February 19, 2018. 4- flcourts.org. Accessed on February 19, 2018. Cahali. 5th edition revised and updated. Thomson Reuters. Journal of the Courts. 2015.